After the horrible white supremacist violence in Charlottesville, and Trump's brinkmanship with North Korea, most are us reeling. Issa of course remains silent. We hope you'll be able to gather with our extended Indivisible family today and throughout the week to show our love and strength. And to help us fight against the GOP's planned tax cuts for the super rich. Sunday, August 13, 2017, 8:00 p.m. to 11:00 p.m.
Sunday, August 13, 2017, 6:00 p.m. to 8:00 p.m.
We will stand in unity, rally at the four corners of Hwy 101 and Encinitas blvd then walk with candles along Hwy 101. Thanks to the 456 protesters who showed up this Tuesday. We successfully drowned out the handful of Trumpsters who attend weekly now. See more pictures here. Also check out this video. An amazing turnout (600+) and excellent Q&A yesterday morning with the three democratic candidates for CD49. "Issa: Biggest threat since Cuban Missile Crisis"
"Issa: I wish Trump would tweet judiciously"
Tuesday, August 15, 10:00 a.m.: Weekly Rally at Issa's Vista Office - "Not One Penny"
August 15th is the official kickoff of the Tax March's "Not One Penny" (in tax cuts for the super rich) campaign. This comes as President Trump and Congress have made tax code changes their top legislative priority. We have t-shirts for the first 100 rally attendees! We will sign a "Not One Penny" letter to Issa and have postcards ready for you to mail. And if you don't have time to make a sign this week, we have Not One Penny signs for you. In Issa's recent newsletter, he said he has been getting to work on tax reform. 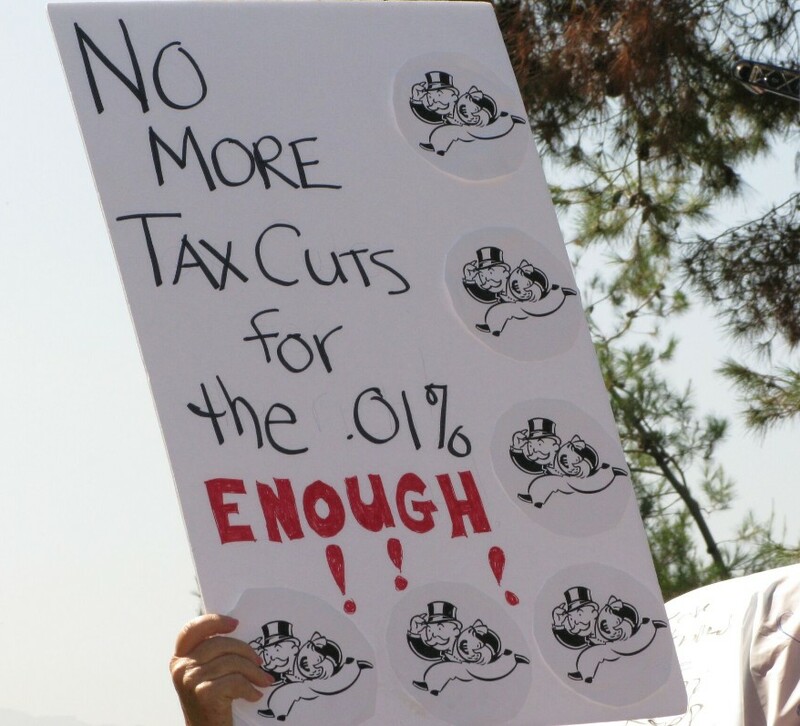 Let's show up in numbers to remind Issa that he works for us and we do NOT support tax cuts for the super rich! Bring your signs, your friends, and your energy! See here for more details and to RSVP. MARK YOUR CALENDARS! Be on the lookout for our possible upcoming Budget Townhall dates: August 21st-27th (pending availability of speakers). Rep. Issa and Sen. Harris have both been formally invited. No word from Issa yet. Congress is on recess, so our Legislative Team is taking a well deserved break for the month of August. Thanks for all the hard work! Call Issa and let him know loud and clear that you do not support the GOP tax cuts for the rich. Call Issa to ask him to speak out against the terror attack in Charlottesville (and Trump's cowardly statements). Check out the Indivisible August Recess toolkit. By Tuesday 8/15, please comment on the Administration's plan to shrink or eliminate four of California’s marine sanctuaries to “clear the way” for offshore drilling. Follow the links and then click on the Comment Now! blue button.